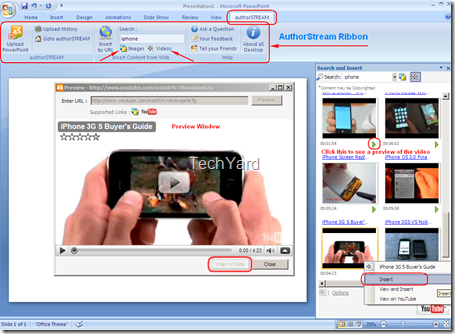 MS Office Power Point is used for presentations in meetings, but till date you could only insert clipart,images, flash using 3rd party addons and videos that were present on your drive, but using authorStream Desktop MS Office addon you can now insert YouTube videos in your presentation, and share it online at AuthorStream keeping intact the videos in your presentation, and view or download the presentation at authorStream. You can also search for images for your presentation from Bing, right from PowerPoint.On Installing the Office-addon you’’ see a new addition “AuthorStream” to the toolbar and from where you can search for videos and images. 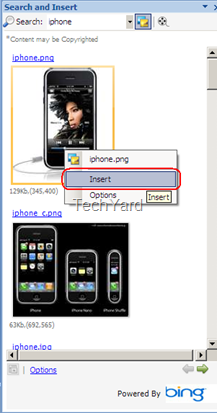 use a URL of an Image or YouTube video and insert them directly in your slide. 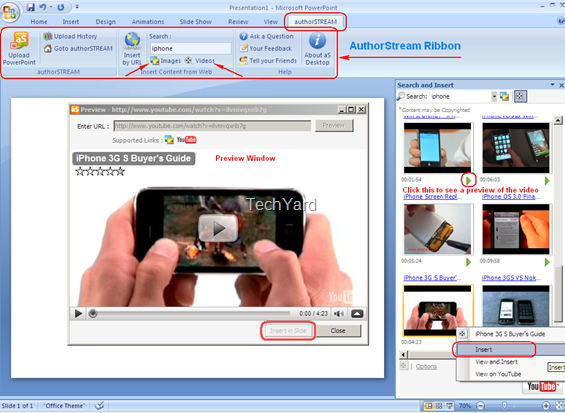 Download and Install the Office 2007 Addon, next from the toolbar select “authorStream”, and the authorStream Ribbon can be seen, search for images or video that your looking for and click on the appropriate button and a new windows with the search results appear to the right of the Slide, Right Click on the image/video of your choice and select insert. Note : You need an active internet connection during your presentation for the YouTube video to play. Is there any addon like this for openoffice? .-= Bernadus´s last blog ..A Brief Introduction to the Google App Engine =-.